Natures lovers, walkers, cyclists and motorcycle riders... we have found the property for you. Your host has a definite idea of what Texas is all about and is anxious to share this love of Texas through his cabins. 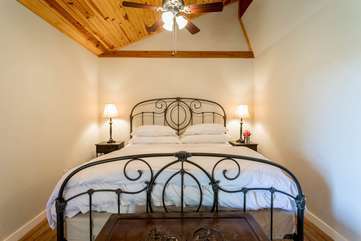 Located just across the street from the well known and popular Alamo Springs General Store and Café these cabins are not only beautiful and private, but they are comfortable too. Each cabin is set up for a romantic or just a casual weekend driving through the countryside. Let us introduce you to Alamo Springs Country Cabins. The Country Cabin (1) and The Barn (2) The first two cabins “The Country Cabin” and “The Barn” offer a rustic elegance. Each cabin has a long front porch decked with comfy rockers to enjoy a view of woods and wildlife. Inside these one room cabins you will find a king bed topped with luxury linens and fluffy decorative pillows. The bed is facing the open living along with the leather sofa (also a full size bed) and both are placed to enjoy the television and fireplace. A fully equipped kitchen has a range/oven, large refrigerator, microwave, coffeemaker and toaster along with the table which can easily seat 3—4 people. Guests favorite part of the cabin probably will be the bathroom with it’s large corner whirlpool tub so important for those special weekends. It also has a separate shower. Ever taken a shower or washed your hair in rainwater? These cabins are supplied with pure, sparkling, clean and refreshing rainwater—and it tastes so good, you’ll want to take some home. LOCATION - 14 miles out the Old San Antonio Hwy. Approximately a 23 minute drive from downtown Fredericksburg.